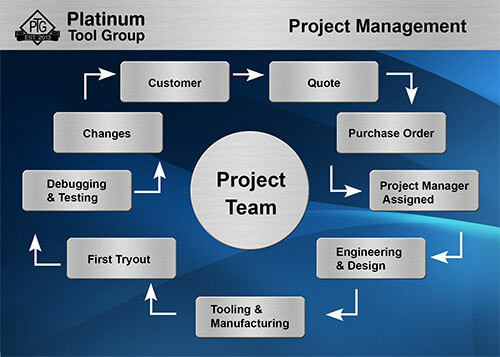 The moment the Platinum Tool Group receives an order, a project manager is assigned to the project. The manager participates in all levels of design review with the customer to assure all design change requests are implemented. The project manager is your liaison to Platinum’s manufacturing operation, communicating with all departments to address your requirements in a timely manner. The project manager assesses the impact of the change through colored overlays of the data and responds back to the customer regarding any feasibility issues and impact with regard to timing or costs of any change requirements. From here, both parties can make a sound decision on how to proceed. Through vast experience, skills, and resources, we develop solutions that add value and cut costs while enabling our clients to achieve their objectives. Contact us to discuss how our project management services can work for you.